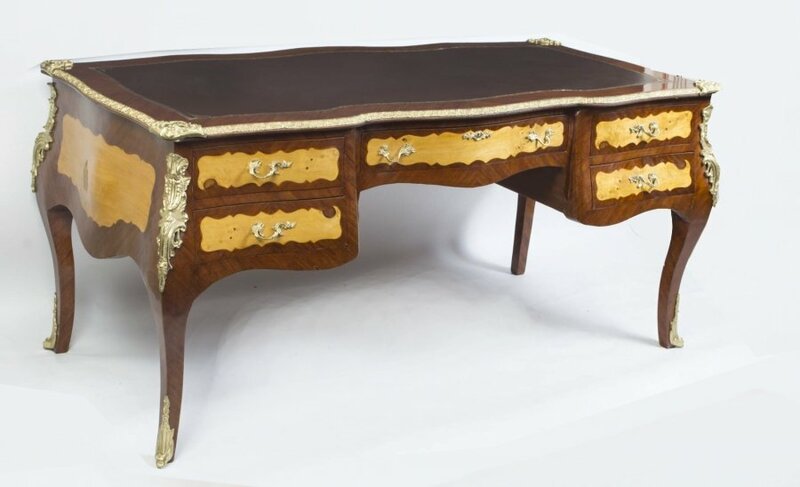 This wonderful walnut antique bureau plat with ormolu mounts is in the French Louis Revival style and dates from the early 20th Century. 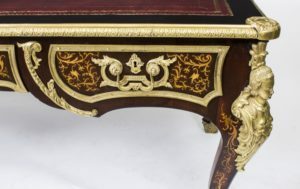 All fully adorned with wonderful ormolu handles and mounts, this bureau plat has three frieze drawers on one size and three ‘dummy’ drawers on the other, meaning this item can be placed anywhere in a room, including against a wall with no loss of usability. Equally it can be free standing in the middle of a room and look wonderful. 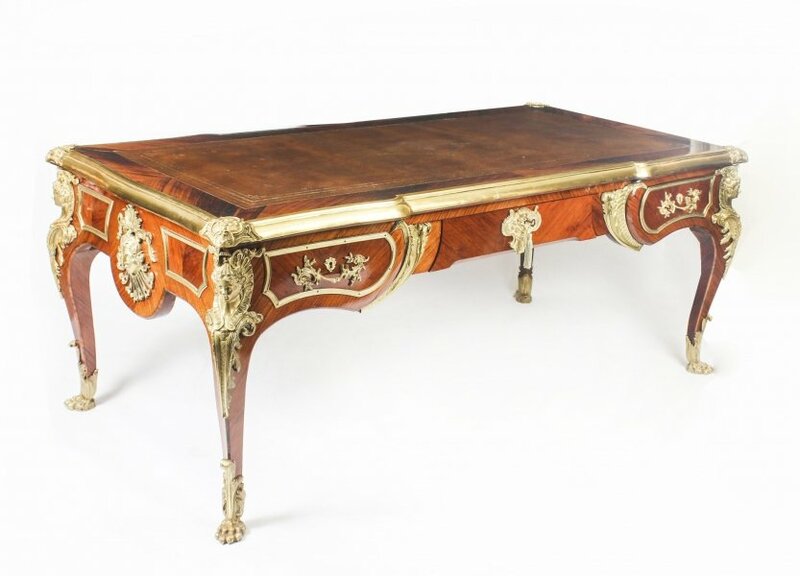 Priced at £5,250, this extremely elegant item will add panache and glamour in any setting. 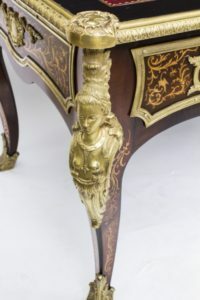 Ormolu is an 18th Century English term for the process for producing ‘gilt bronze’. This was where finely ground high-carat gold was applied in a mercury amalgam to a bronze object. When fired in a kiln the mercury was evaporated off leaving a gold-coloured veneer which has an extremely attractive finish. Due to health concerns mercury is now no longer used in this process and the more modern electroplating is now used instead. 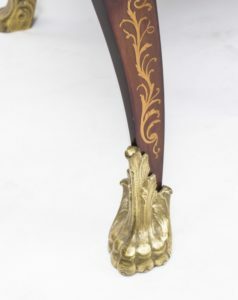 This piece is in excellent condition having been extensively refurbished in our workshops including having the leather reline. Please look at the photos to confirm this for yourself. 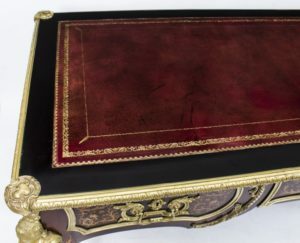 The dimensions of this fine antique bureau plat are are follows: Height 78cm x Width 183cm x Depth 89cm, or in inches; Height 2 feet, 7 inches x Width 6 feet, 0 inches x Depth 2 feet, 11 inches. 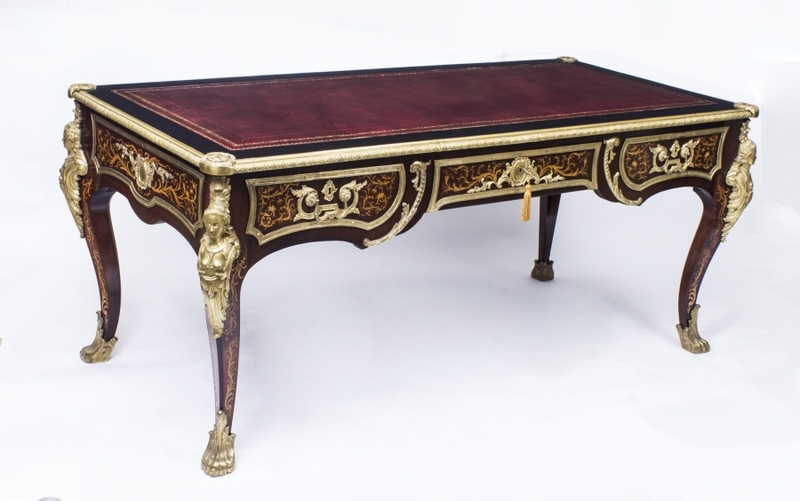 We are always delighted to show you our items in our North London warehouse. Simply email or call (+44 20 8809 9605) for an appointment. 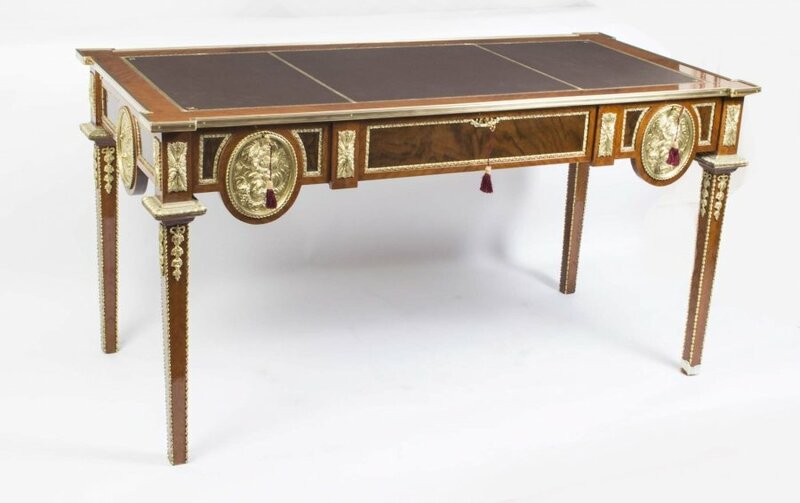 You can also email or call if you have any questions about this antique bureau plat. 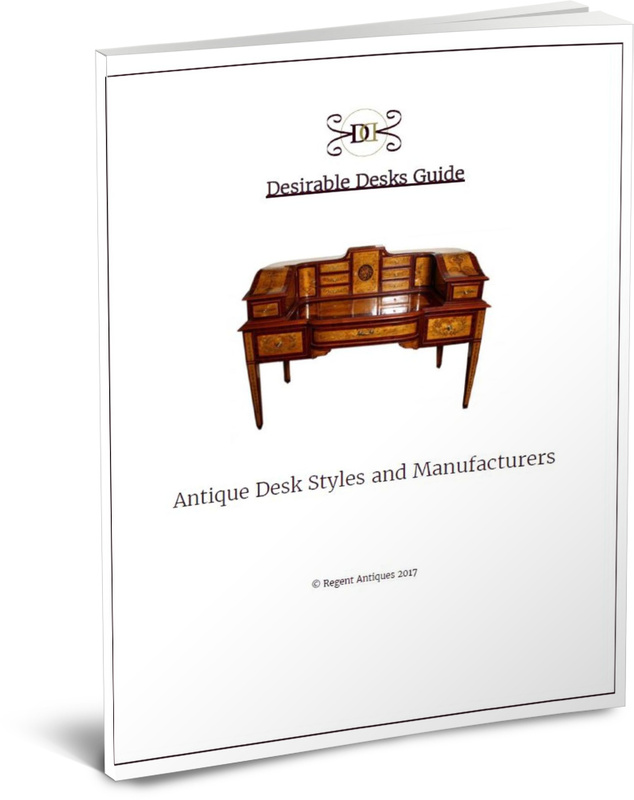 Our experts are always on hand and would be very happy to discuss any aspect of this lovely desirable desk. Quote our item reference 07618 so we know exactly which piece you want to discuss. We are happy to pack and ship to any destination worldwide. However, please call for a quotation before purchasing the item and be aware that you will be liable for any customs duties or internal taxes due outside the European Union. We ship free of charge to any UK mainland destination. We adhere to the Distance Selling Regulations and offer a 14-day money back guarantee if you are not satisfied with the piece. Please be aware that you will be liable for the return shipping costs should this turn out to be the case, so do take the opportunity to view and/or discuss the item with us before you buy.